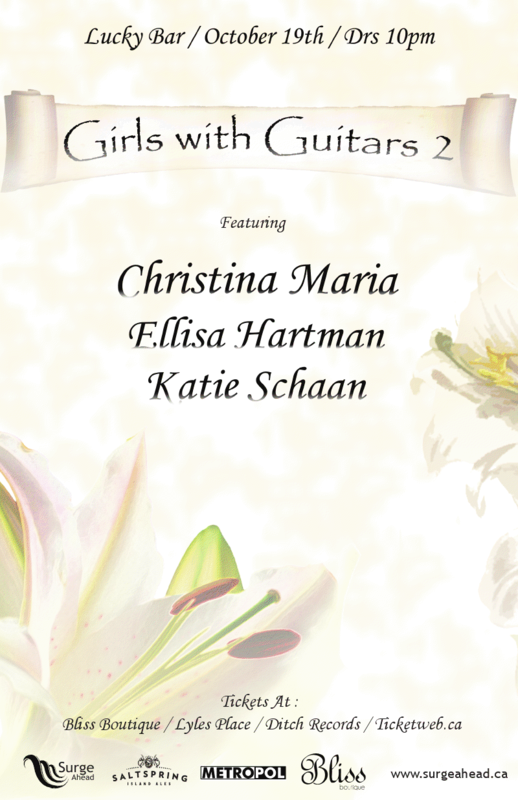 Island SoapBox is proud to be covering "Girls with Guitars" at Lucky Bar, coming Tuesday October 19. Three incredibly talented singer/songwriters will take the stage that evening, and Island SoapBox wants you to know a bit more about them before you come out and see them! Ellisa Hartman is one of those fine acts. The 23 year old is a whole lot of talent. Although she is in the beginning stages of her musical career, she certainly doesn't lack musical experience. A self-described "band geek" in high school, Hartman has learned all sorts of instruments ranging from Stand-up bass to Saxophone. The guitar though, not surprisingly, is home sweet home for Hartman. "My father was a musician, he was a guitar player, bass player. You know when you're a kid you look up to your parents, and my dad was my hero. I'd sneak dad’s acoustic guitar out of the bedroom and try and play it when I was a kid. I taught myself how to play. 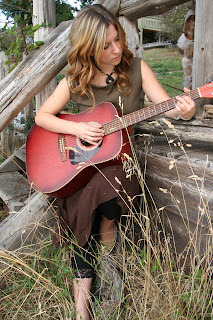 I think musicians can generally play more than one instrument, but we all have one we can play the best. It's the one I actually feel I can play with confidence." Although Ellisa has recorded an album (Arbutus), and played with some great acts, she is still breaking into "the industry". The music takes care of it self, writing songs are a "piece of cake" when compared to the business side and getting those songs out there. "It’s hard to find the line between being confident and being arrogant. I think you need a little bit of ego to do certain things, like get up on stage and sell your soul. It’s definitely a game, you gotta play your cards right for sure. It's hard cause you are your own promoter, and for me that’s tough. "Hi, my name is Ellisa and I'm a really awesome guitar player and you should let me play in your bar". It's a really uncomfortable thing for me to do, and I’m sure I'm not the only one. I’m having a hard time trying to reach out to other musicians, it’s definitely not always quite as welcoming as I would like it to be. I think if we all did form a strong community, everyone would benefit from it." 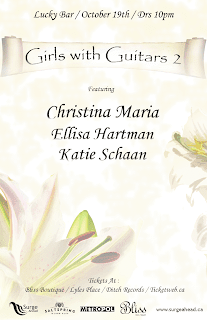 Well perhaps Girls with Guitars is just what Hartman needs at this point. Surge Ahead is showcasing just what this province has to offer, extremely talented female musicians who deserve the stage as much as anyone else. With a talent pool so deep, the Vancouver Island talent is thrilled at the opportunity. "There are so many talented girls all over the island, it's humbling for sure. There is a lot of great talent out there. I think it’s a great idea. Surge has been really awesome and good to work with. It's great that people are looking out for the small local musicians that are out there. And Lucky Bar is a really nice venue as well. Definitely looking forward to it." Away from music, she is an accomplished diver, having strapped on the Oxygen and dove into the ocean depths in several continents. It may be surprising to some, but Hartman says although the waters here may be colder and murkier than other places, it's some of the best in the world. "The diving here is probably the best I've seen and I've been to Asia and Central America. The life here is unbelievable, it's just amazing." The Scuba Diving here may be some of the best in the world, and I'm willing to bet our music scene isn't far behind. Tuesday October 19 will be an opportunity to see the great talent that is developing right here in our own backyard on full display. "It's the only thing I'm really good at, you know what I mean? Everyone has that one thing. That's music for me. I want to be a musician." When Hartman takes the stage and strikes that first chord, cheer loud and let her know she's already there.